Half of adult Facebook users have never heard of its free Watch video service, according to research by US-based The Diffusion Group. 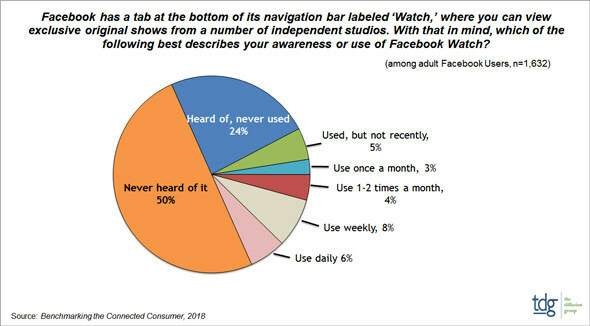 The research found that 50% of the polled Facebook users had never heard of Facebook Watch, while a further 24% had heard of it but never used it. This meant that only 27% of Facebook users had engaged with Facebook Watch – 6% on a daily basis, 8% weekly, 4% a couple of times a month, 3% once a month, and 5% who had used it, but not recently. “Despite the slow build of Watch users, it would be remiss to underestimate Facebook’s long-term potential as a large-scale video provider,” said Michael Greeson, president of TDG. “As we first noted in 2016, prominent social platforms like Facebook are looking for ways to exploit their massive scale to sell new video services to their users, much as Amazon has done with Prime. Facebook launched Watch, its platform for episodic programmes, in the US in August 2017, billing it as a platform for creators and publishers to “find an audience, build a community of passionate fans, and earn money for their work”.